Model 1370 pressure gauges are specifically designed for use with pneumatic transmission of process variables. The model 1370 is compatible with a wide variety of transmitters capable of converting properties like flow, temperature, differential pressure, and level into a proportional air pressure signal. You may choose from 2", 2½", and 3½" gauge sizes for panel or stem mounting. 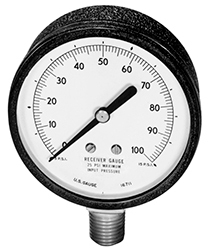 The Model 1370 receiver gauge provides a graduation arc of 2700, for a pressure change of 3 to 15 psi; or a span of 12 psi. Transmitters are calibrated so that lowest value of the variable to be measured creates a pressure signal of 3 psi; while the highest value creates a pressure signal of 15 psi.